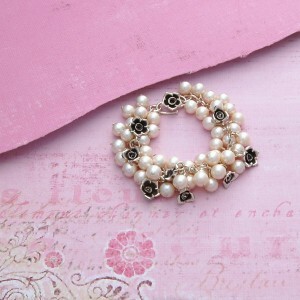 Since we had the website re-vamped we have been looking into photographing our jewellery on new backgrounds. I cannot tell you how hard it is to photograph jewellery, We must have thousands of pics that we have taken but cannot use due to them just being rubbish lol. We have tried numerous props but they do not work for every piece due to different colours but then last week we were doing a bit of shopping in one of those “we have it all shops” and we came across a big pad full of fantastic looking vintage textured paper. It has different colours with different patterns but because its thick with a texture to it its great for jewellery. So we have been busy snapping away to get some fresh pics whichork and look fab. It makes it so much easier to get good pics without spending half a day wondering what colours and props to use so here is our latest rework which is our beautiful Rosa bracelet on a delicious pinky background. This entry was posted on Monday, September 27th, 2010 at 11:36 pm	and is filed under Handmade Jewellery, Jewellery Inspiration, Silver Jewellery.